What it is: An Apple Watch may hold the key to defining the time of death of a murder victim. The Apple Watch’s best use is real-time health monitoring, but this has a side effect. An Australian women, Caroline Nilsson, has been charged with the bashing murder of Myrna Nilsson. Caroline claims that Myrna was the victim of a road rage incident where a group of teens followed Myrna home and killed her. However, one key piece of evidence against this claim is that Myrna was wearing an Apple Watch, which recorded her heart rate data. Apparently the Apple Watch recorded data consistent with an ambush-style attack where Myrna’s heart rate jumped dramatically as if under attack, then suddenly slowed as if she lost consciousness before stopping altogether. By using this heart rate data and the time that it occurred on the Apple Watch, prosecutors believe this contradicts Caroline’s story. Since the Apple Watch continually monitors health data like heart rate, it could possibly be used as evidence to define the time of death of the victim. As more people wear devices like the Apple Watch, expect to see criminal cases supported or contradicted by the data stored on a victim’s Apple Watch. After all, the Apple Watch simply records data so it’s a silent witness to any type of murder. The Apple Watch is best for real-time health monitoring but in criminal cases, it can be handy to provide evidence on murder victims at the same time. To read more about how the Apple Watch may provide evidence in a criminal case in Australia, click here. What it is: The number of augmented reality apps in the iOS App Store continues to grow rapidly. Pokemon GO ignited the augmented reality industry by letting you search for Pokemon cartoon characters in your everyday surroundings. This helped teach people how augmented reality worked by letting you point your smartphone camera at the ground and see a cartoon Pokemon monster as if it were actually there. Once Apple introduced its ARKit to make it easy for developers to create augmented reality apps, developers responded quickly by introducing all types of apps that offer augmented reality. Not surprisingly, most augmented reality apps involve games. IKEA’s augmented reality is an example of a non-game augmented reality app that lets you view furniture in your home so you can see what it might look like before actually buying and setting it up in your home. With Apple’s ARKit helping fuel the augmented reality market, it’s no surprise that Google rewrote their augmented reality framework to offer augmented reality to Android developers. This summer, Apple will release ARKit 1.5 which will allow mobile devices to detect vertical surfaces in addition to horizontal surfaces. This will allow an augmented reality app to place objects on a wall, which can be handy for displaying ads or viewing decorations such as paintings or different types of wallpaper or colors. The main lesson is that augmented reality is growing rapidly through mobile devices like the iPhone and iPad with Android trailing behind but likely to catch up soon. That means you can expect more uses for augmented reality beyond games and entertainment. Once people start seeing practical uses for augmented reality beyond gaming, augmented reality will become commonplace. Yet the world of augmented reality now offers app developers a new niche to fill. The App Store is already flooded with apps but augmented reality gives developers a new market to target. Augmented reality works because it’s easy to use. Just pull out your smartphone and look through its screen while aiming its camera somewhere. In comparison, virtual reality is far more limited because you must shut out the world around you and strap a bulky device to your face. Augmented reality can be used easily anywhere you go. Virtual reality cannot, and that’s why the future bodes well for augmented reality. To read more about the popularity of augmented reality apps, click here. What it is: Apple announced a new low-cost iPad that supports the Apple Pencil. The future is the Apple Pencil (for $99) or the Logitech Crayon ($49). At Apple’s educational event, the company introduced a new low-cost iPad along with a classroom app to allow teachers to monitor and track the progress of students. Even more appealing is that Apple also introduced new version of their iWork suite that allows students and teachers to draw pictures or insert annotations using the Apple Pencil or Logitech Crayon. Will a lower cost iPad, classroom monitoring, and annotation features help the iPad in the education market? Yes, but many schools will still look at the much lower price of Chromebooks and simply go with the cheaper option instead, regardless of any features offered by Apple’s iPad option. For those schools willing to pay more for the iPad’s new features, students will be able to create interactive digital books using Pages on an iPad. They can add audio, video, graphics, and photographs with text to create interactive ebooks directly on the iPad through Pages. Then people will be able to view those ebooks through the iBooks app on either iOS or the Macintosh. Apple’s latest educational event is emphasizing the iPad over the Macintosh because the iPad is the future while the Macintosh represents yesterday’s technology. Many people still prefer the Macintosh over the iPad because the Macintosh is still more powerful than the iPad – for now. Remember, at one time, Blu-ray disk drives were once important to PC users although the Macintosh never had them. Now Blu-ray disk drive are meaningless because nobody needs them any more, even PC users. So if the iPad feels limited to the Macintosh today, it’s because it still is. Tomorrow that will change so Apple is focusing on the future (the iPad) and not the present (the Macintosh). Expect the low-cost iPad to be popular with Logitech’s keyboard and crayon accessories that make drawing and typing easier, but Chromebooks will still dominate the education market due to their lower cost and simpler maintenance. Chromebooks are essentially disposable devices so schools won’t worry too much if students lose them. iPads are far more valuable, so the richer schools will likely be the only ones that can afford the iPad in the classroom. Apple’s latest iPad won’t capture the education market from Chromebooks, but it can help convince a handful of schools to choose iPads over Chromebooks. As the iPad gets more features, Chromebooks will need to catch up or risk looking too archaic, like trying to put MS-DOS PCs in classrooms today. The education market still belongs to Chromebooks, but the real fun and flashy features belong to the iPad. To read more about the latest iPad, click here. What it is: For the longest time, Apple products have been used in schools and now Apple ha an education event scheduled for March 27. In the early days, schools used Apple II computers. Then schools shifted to more popular MS-DOS and Windows PCs. Finally, schools shifted to cheap Chromebooks that are easy to maintain, inexpensive to buy, and cheap enough to be disposable if students break them. Competing against cheap Chromebooks limited the iPads to schools that specifically wanted the iPad instead of Chromebooks, but most schools opted for cheaper Chromebooks instead. Now Apple needs to get back into the education market because what students use in schools, they tend to use in the work place. That helped establish Windows as the dominant business operating system and it’s now helping Google break into the corporate world as well. First, Apple needs cheaper iPads, not the same price as Chromebooks, but low enough to be appealing. Apple can never compete against Chromebooks on price so price is just one factor to make iPads more appealing. Second, Apple is planning to release ClassKit, a program that lets teachers track and monitor the progress of students through an iPad. If ClassKit proves practical and useful, that could help steer more schools into paying more for iPads to get more features than a cheap Chromebook can offer. Third, Apple is emphasizing coding for everyone and that means they need to put Xcode on the iPad. This would let students create iPad apps directly on the iPad. With the iPad processor getting more powerful with each generation, it’s essentially as powerful as last generation’s PCs. That means an iPad should have enough power to create iPad apps. By letting students create iPhone/iPad apps directly on an iPad, Apple could insure a generation of programmers and make iPads more appealing in classrooms as well. So the combination of lower prices, classroom tracking, and app development should help steer more schools towards iPads over Chromebooks. If price is an issue, schools will always choose Chromebooks. If features are the priority, then Apple hopes schools will choose iPads. Chromebooks will likely continue dominating the education market, but Apple just needs a sizable share of the education market to maintain the popularity of iPads. Ideally when schools compare the features of an iPad to a Chromebook, they’ll see the iPad offers more value. Apple needs the education market and the iPad will be the key to keeping students wedded to Apple products now and in the future. To read more about the future of the iPad in schools, click here. What it is: The popular Fortnite game is cross-platform so iOS users can play against console and PC users. Mobile gaming has traditionally lagged behind console and PC gaming simply because the hardware behind smartphones and tablets were never powerful enough to compete against the processors and graphics cards in dedicated game consoles and PCs. That’s now changing. With both the iPhone and iPad getting processors that are equivalent to PC processors, the iPhone and iPad are nearly equal to processing power of game consoles and PCs. Toss in improved graphics capabilities and mobile gaming is no longer a second class citizen but an equivalent platform for gaming. Consoles and PCs will always have the edge in hardware game control accessories but the fact that an iPhone and iPad can rival the processing and graphics capabilities of game consoles and PCs is still astounding. With game console hardware updating every few years, iPhone and iPad processors and graphics will eventually catch up and surpass game consoles altogether. As mobile processors rival processors found in PCs, the hardware difference will be even, if not in favor of mobile platforms. That means the games of the future will need to tap in to the console, PC, and mobile game market at the same time. Games may seem like a trivial use of computers, but it’s a lucrative one. Windows still retains its popularity not because of PowerPoint or Excel, but because of gaming. If you want a great gaming PC, you want a Windows PC, not a Macintosh. The Xbox and PlayStation are nothing but dedicated game computers, and they’ve been money makers for years. Games typically earn millions within the first month of their release, surpassing even Hollywood blockbuster movies. The world of gaming is highly profitable. That’s why the fact that iOS is nearly equal as a gaming platform to consoles and PCs is a remarkable milestone that will only improve over time. The next time someone hints that mobile computers aren’t as good as PCs or game consoles, they’ll be wrong. That type of thinking worked in the past, but is wholly inaccurate today. Where the gamers go, that’s where the users will go too, and that means a bright future for all iOS devices. To read more about the future of iOS as a gaming platform, click here. 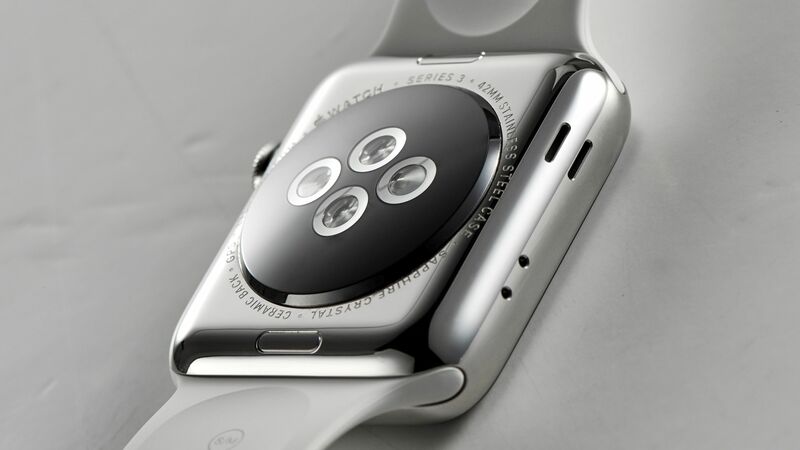 What it is: Bloomberg reports that Apple’s next Apple Watch could detect heart abnormalities. The best way to prevent health problems is to detect them early. The problem is most people won’t bother looking for health problems until they’ve gone too far. That’s why wearable computers like the Apple Watch can be useful because they can detect problems long before major symptoms appear. That way users can get help long before the problem spirals out of control. According to the latest rumor, the next version of the Apple Watch might include new sensors to detect heart abnormalities. Right now, the Apple Watch can detect many problems but improved and additional sensors will be able to make real-time health monitoring even more accurate. Eventually, it’s likely the Apple Watch will split into two markets. First, there will be the general market to detect common health problems. Second, there will be the specialized market dedicated to monitoring specific health issues such as diabetes. This could work by having smart bands attached to the Apple Watch. That way only people who need this feature could buy and use it separately from the Apple Watch. Such smart bands could be dedicated to specific health issues, allowing the Apple Watch to remain general enough for most people with smart bands dedicated to niche markets that need dedicated sensors. In this way, the Apple Watch can meet the needs of general users and people suffering from specific health issues. The Apple Watch is leading the wearable computer category and will likely continue to dominate. As the benefits of real-time health monitoring become more apparent, it’s likely that the Apple Watch will one day become more important than a smartphone. Toss in the Apple Watch’s cellular network connectivity and for some people, an Apple Watch might be all they’ll ever need. To read more about the possible future health monitoring features of the Apple Watch, click here.